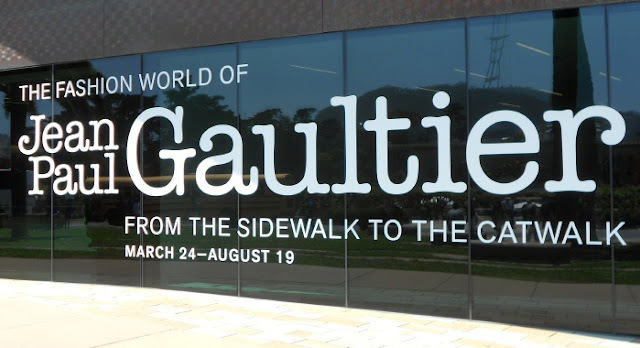 The exhibition ends in August and well, I just had to see it before it was too late. 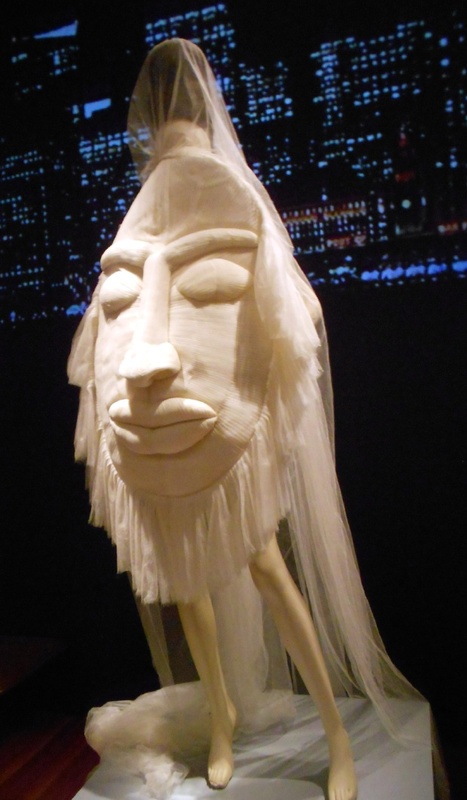 My NIKOLAKI design partner--David Paul--as well as his mom Conchita (who was in from San Diego) came with me. Signed Wall: Jean Paul Gaultier autograph, de Young Museum, "The Fashion World of Jean Paul Gaultier: From Sidewalk to the Catwalk"
This dynamic, multimedia exhibition includes 140 haute couture and prêt-à-porter designs created between the mid-1970s and 2010, along with numerous sketches, archival documents, fashion photographs, and video clips that spotlight Gaultier’s collaborations with filmmakers, choreographers, and musicians, most notably Madonna (keep reading). Talking Gaultier: de Young Museum, "The Fashion World of Jean Paul Gaultier: From Sidewalk to the Catwalk"
For this presentation, Gaultier partnered with the Montreal-based theater company Ubu Compagnie de Création in the design of 30 animated mannequins who talk and sing in playful and poetic vignettes. 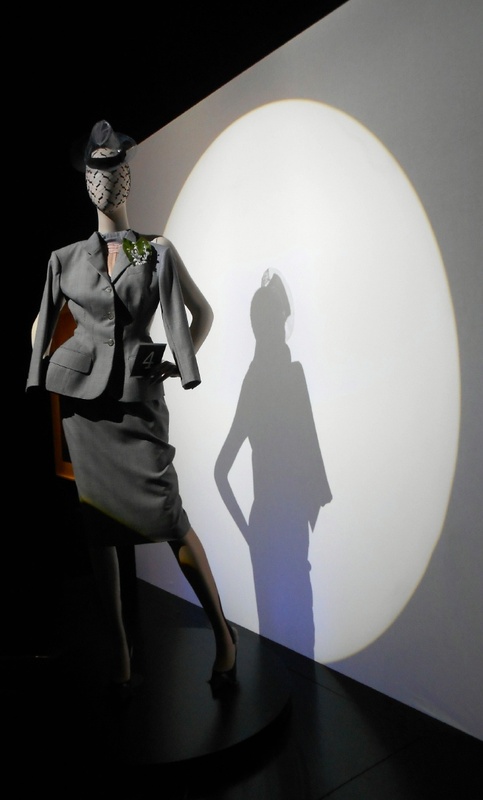 Besides these "talking mannequins", there was a "moving runway" which also featured many of his designs. Faux Suit and Native American Wedding Goddess, de Young Museum, "The Fashion World of Jean Paul Gaultier: From Sidewalk to the Catwalk"
There were many. 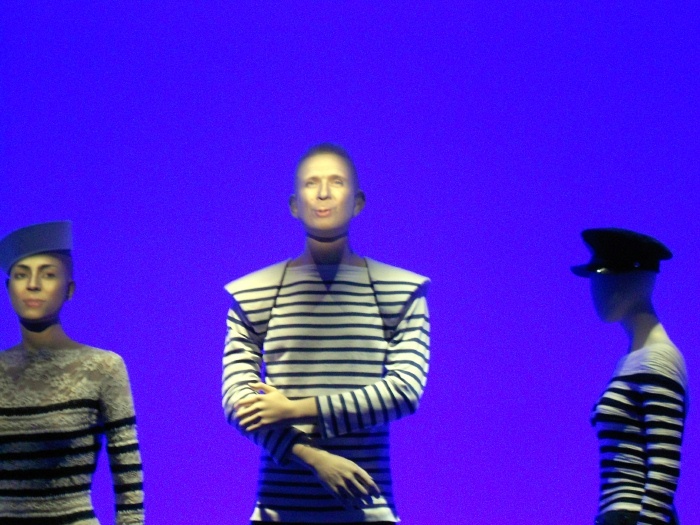 The exhibit was marvelous in its all-encompassing grasp of Gaultier's world. 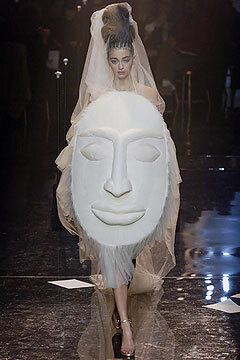 I LOVED every minute of it. It was amazing to be so close to the awe-inspiring handwork of Haute Couture and seeing the gowns and tailleur. 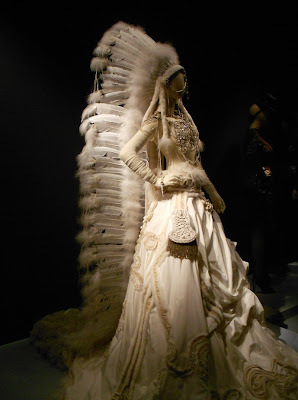 I LOVED his "faux" suit where a gray jacket sat affixed to straps on the mannequin...and the Native American Wedding Gown: Perfection (both seen in above pics). 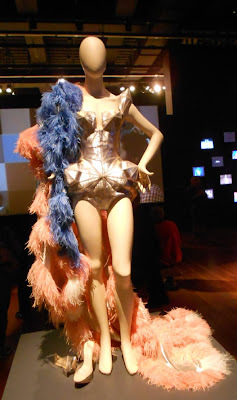 Gaultier Nautical Princess: A striped sweater and feathered gown creation: (right) as worn on Princess Caroline of Hanover and on the mannequin (right), de Young Museum, "The Fashion World of Jean Paul Gaultier: From Sidewalk to the Catwalk"
Barbarella Couture: A look from Jean Paul Gaultier Fall/Winter 2009 Haute Couture Collection modeled by Magdalena Frackowiak (left) and on a mannequin in the de Young Museum "The Fashion World of Jean Paul Gaultier: From Sidewalk to the Catwalk" exhibition. 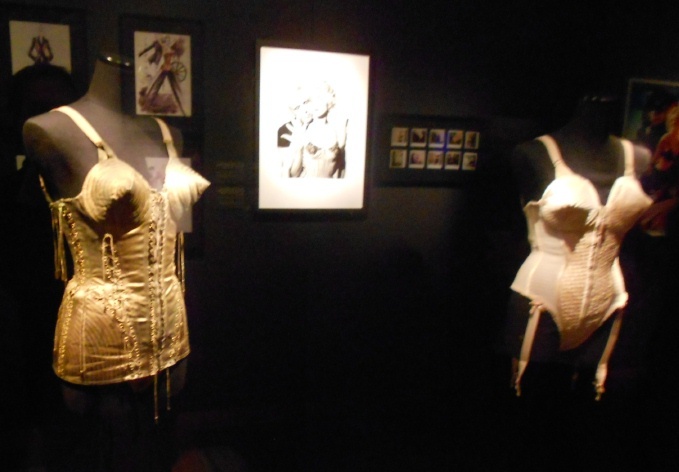 Of course there were several sections of the exhibition paying homage to Madonna and her costume collaborations with Jean Paul Gaultier, including the famous--or is it infamous--cone-bra. 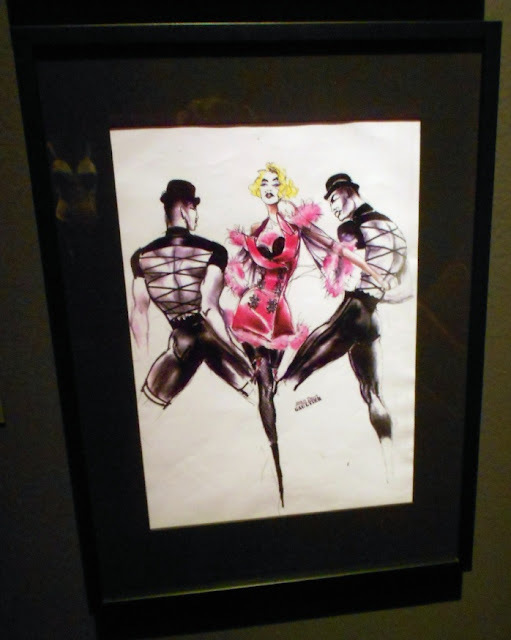 It was a FABULOUS exhibition and I was so happy to have seen it! If you guys are in San Francisco and LOVE fashion, costume exhibits, Haute Couture, and Madonna...it is a MUST-SEE! 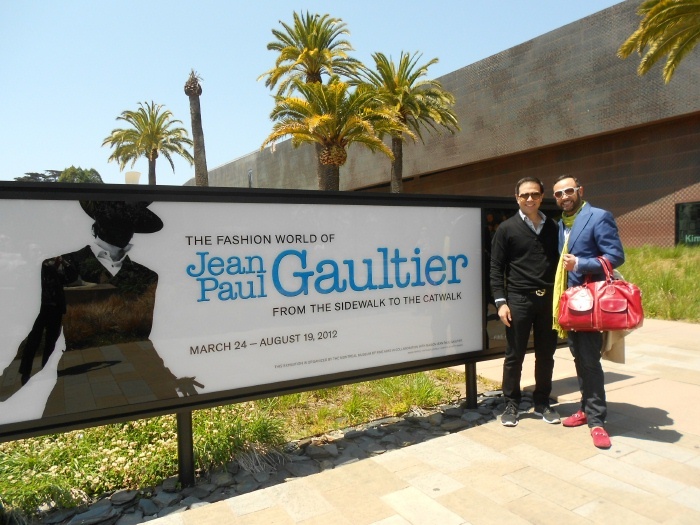 1 Response to "TRAVELING IN STYLE.....Jean Paul Gaultier Exhibition, de Young Museum San Francisco"
what is that red bag ?